How many of you have pets that light up at meal time? In our household, meals are a big deal and usually lead to a happy little dance before snuggling with their food bowl. While they eat, it is sometimes easy to forget that not all dogs and cats are as lucky as our furry daughters. According to PetSmart Charities®, up to 7 million pets enter shelters every year in North America, with only 20% of non-profit organizations receiving food donations. 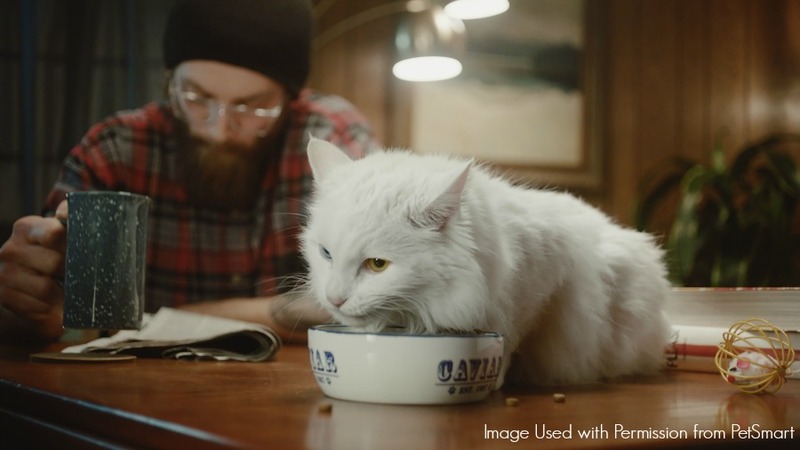 As well, they found that 1 in 7 Americans depend on food banks to feed their pets, many giving up feeding themselves sometimes to make sure their pets eat. If you are anything like us, you want to do SOMETHING to help these animals in need. For this reason, we were excited when we heard about PetSmart®’s Buy a Bag, Give a Meal™ program! As part of their 30th anniversary celebration, PetSmart is excited to be giving back to their community by helping animals in need. From March 1 through December 31st, 2017, every time someone purchases a bag of food from PetSmart.com or a PetSmart location, they will donate a meal to a pet in need. It doesn’t matter what size or brand of food you purchase, as long as it is from the PetSmart website (US or Canada), or one of the 1,500 plus PetSmart locations in the United States, Canada, and Puerto Rico. It is estimated that by the end of the year, they will be donating more than 60 million meals to dogs and cats in need! Here is what they have to say about the new PetSmart®’s Buy a Bag, Give a Meal™ program! So, where is the food going to be distributed? 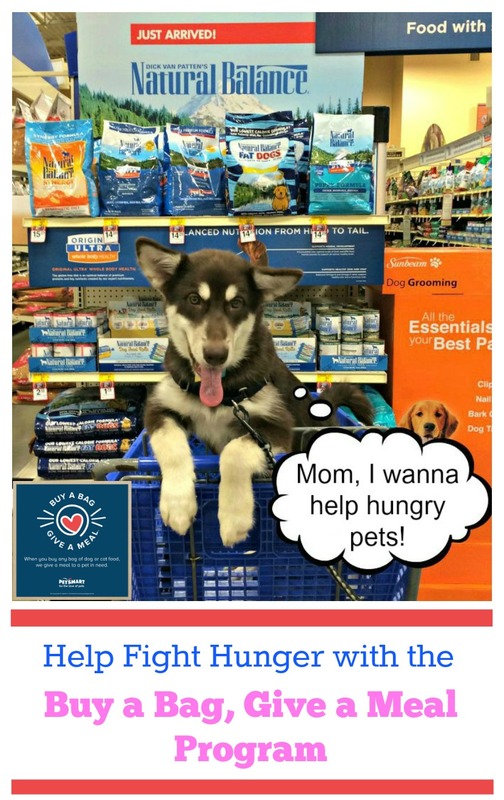 According to the PetSmart®’s Buy a Bag, Give a Meal™ press release, PetSmart Charities will distribute the meals themselves to pet shelters, rescue organization, and food banks throughout the United States and Canada. This means that pets will get the food they need! They are just as excited as PetSmart about this wonderful program to help dogs and cats everywhere! So, are you ready to help dogs and cats in need? 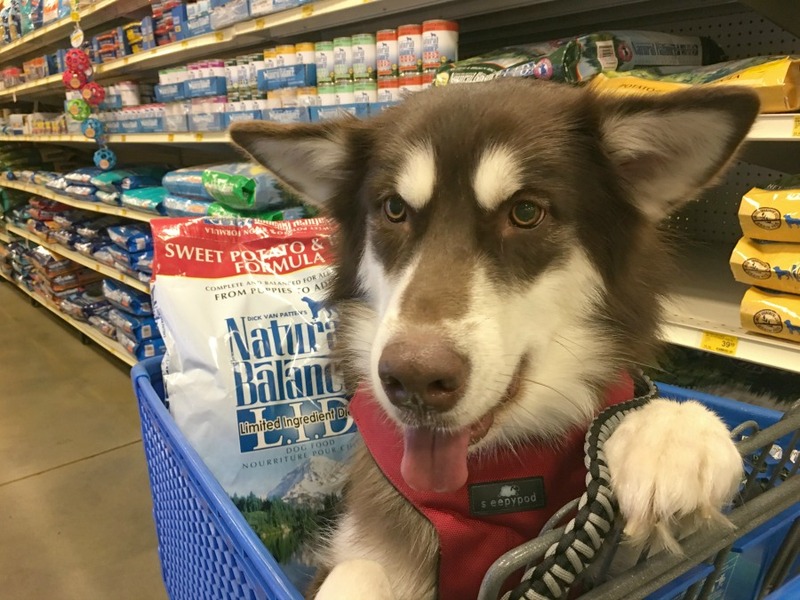 We can’t say how excited we are that every bag of food we purchase will be helping feed a dog or cat living in a shelter or rescue organization. We all know that shelters and rescues need all the help they can get, especially since the more food they have, the better the chances are they can help more pets find their forever homes! Ivi and Rylie are ready to help shelter when they help mom and dad pick out food at PetSmart! Are you ready to learn more? 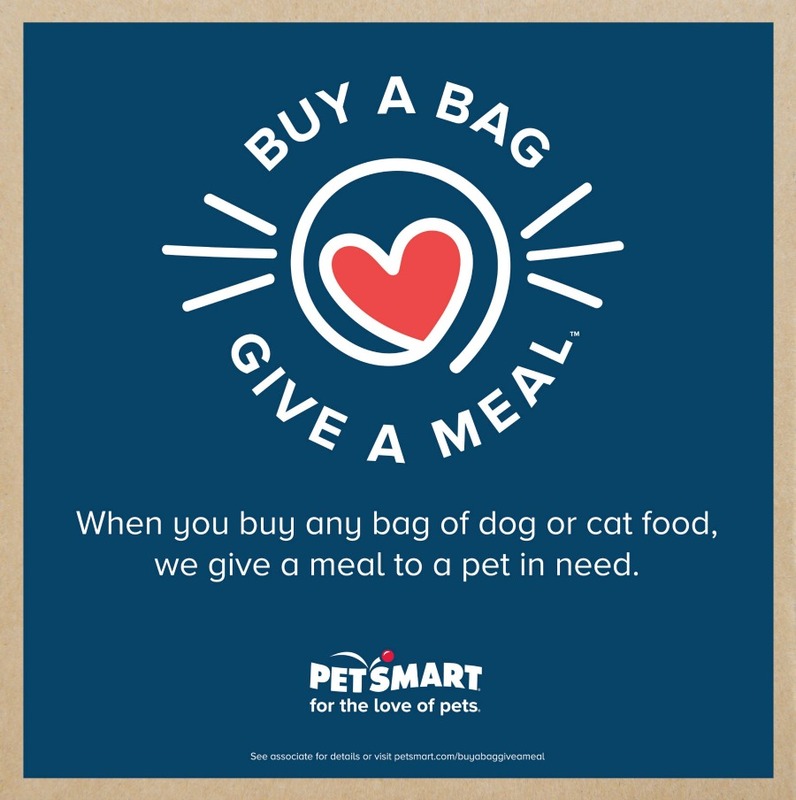 Make sure to check out the PetSmart’s Buy a Bag, Give a Meal™ program and see how you can help dogs and cats in your community today! Want to learn more? Check out PetSmart on social media! Aw, I just adore this!! Like humans, I don’t think that any pet should go hungry!! Im glad to see a company giving back! So happy to see Pet Smart doing this. I will buy one next time I go there. Love that Petsmart is giving back. 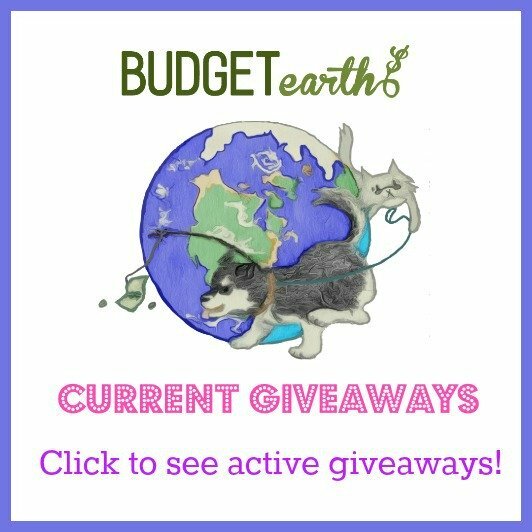 This is such a great way to help out animal shelters and rescue organizations! I wish I had a pet because I would definitely buy this food. I love what this company is doing. This is wonderful! It’s great that it is for 10 months! I posted this earlier but it did not show up. I’ll post it again. This is great that it is 10 months long! Thank-you Petsmart! I like this. Glad to see there is some good news! I’ve seen this for people, but pets? If a person can’t even afford to feed an animal, maybe they shouldn’t have one. That’s just silly. This is awesome! We will be sure to go by PetSmart! What a fantastic program! Kudos to PetSmart! This is an excellent cause, I love it. Thank you for sharing. This is a great program. I’ve shared it on my instagram page. I hope that they get lots of donations from this program to save these precious animals. Yup! Food banks and food pantries in the United States! I was so exited about it! Now that’s a great program! I hadn’t heard of this program before.It’s really great to be able to help. Great program. I always shopped at PetSmart when I had pets. Such an amazing project…Great that there are projects out there to help with animals.. I had never known about this program. I’ve found a new appreciation for Petsmart and will find myself stopping in there more often now. What an amazing program. This is great. We always make donations to shelters and at Pet smart for the adoption program they have. I am a pet person and have adopted all my pets. We buy our food from Petsmart and this is another great reason to continue. This is such a wonderful idea because pets do so brighten up the lives of so many. Nice to be able to help our animal friends. I love PetSmart because they always give back in some way to animals. We have a pet food bank here in Kansas City, I have been blessed to have used them when I was having financial problems. I will be going to PetSmart so that I can buy a bag of food and have them donate a meal. I have entered giveaways before and won them, where the sponsor gives a donation to the shelter of your choice. I have done this twice in the past couple of years and I love entering giveaways that also give something to others. Thanks for sharing. I love my puppy, he is part of our family & I can’t imagine how someone could mistreat an animal who just wants to love you! I am going to go out of my way to buy a bag of food to help feed our furry friends! I just gained some new respect for PerSmart!! I ❤ companies who give back!! I do know what you mean about how happy they are when they know it is time to eat! I never want to let my pets down by forgetting to feed them! I don’t forget to feed myself or my human family!! Wow this sounds like a great program!! I like that Petsmart is giving back to animals. I love PetSmart! We bought a big bag of Blue Buffalo the other day. I think it’s great that they do so many things for pets in need! What a wonderful program. Happy to contribute to it. I love doing whatever I can to help animals. I love things like the click-to-donate pages and things like this, where buying something you need and would buy anyway helps such a great cause. What an amazing thing Pet Smart is doing! No PetSmart close by…bummer. What a wonderful program!! I love that it doesn’t matter what brand of food you buy at their store, that they all qualify for the program and supply a free meal to a pet in need. Pawsome!! Wow, what a fantastic thing Pet Smart is doing! And I really love that it is any brand and size and for over nine months! Think of the amount of food that will be and how that will help pets! Thank you, Pet Smart, for doing something to truly make a difference! This is a wonderful program! I’d go way out of my way to go to Pet Smart so I could give them my business! This is so great. I work with a couple rescues and food is always needed. I had no idea petsmart has been around this long! I’ve only been shopping with them a few years and my favorite store for ALL my pets needs. This is an awesome and much needed charitable project. This is a fantastic program for dogs everywhere! This is such a wonderful idea and your pup is such a sweet spokes-pup! So cute! This is a good idea! I see the same concept in the grocery stores. You can buy a bag for a food pantry. I think these bags are easy for people to help animals or other families. What an amazing program! For the love of animals, buy a bag! Thanks to PetSmart for the great promotion. It’s so nice of them to give back to animals in need. I like when companies extend a hand to help others whether it be fur babies, people, or other organizations that do things that help others. Bravo to Petsmart for caring about their consumers (fur babies) and helping them out. What a wonderful way to give back! Petsmart is a great store. I am amazed by this program! Go PetSmart! I am shocked and saddened that so many folks have to rely on food banks to provide food for their pets. It is nice to know that their our programs out there to provide assistance. I have seen this advertised on TV and I definitely believe in taking care of the animals. Nothing or anyone should go hungry and more organizations should help in certain ways. I love how these companies give back! It gives us more of a reason to purchase from them. Pet Smart is very generous to think of those pets who are hungry. I know it makes me more inclined to buy from them. I don’t have a dog anymore, but I’d like to get one again. This is good to know about–what a great program! This is such a great program, I only wish all stores had this type of program available, no pet of any kind should be left hungry. I read upthread that they are including food banks. There are a lot of hungry people out there and their pets are hungry too! I love and adore seeing companies giving back! Can you imagine if all companies did that?? The world would be such a better place! Our furry friend’s mouths are just as important to feed as the people of the world! What a great program. There are too many hungry pets out there. Petsmart is a good company when it comes to helping pets in need. Keep up the good work. I love to see a big company or outfit give back to the community! i have a pet smart not even a mile away and we visit there all the time! Petsmart always is doing great things for animals. I know they donate to a lot of pet charities and have adoption stations on nearly every store. We shop there and always enjoy it. Petsmart is awesome at giving back to animals! Wow this is awesome. I have used petsmart for years until we moved a few months ago now a different store is a lot closer. I think using a little more gas will be worth it for this Cause. Thanks ! Thanks for the article. This is a great story, way to go Pet Smart. I think this is a great program and wish all of the pet companies would do something like this. It is sad not enough pet food gets donated to food banks. Petsmart has always been a generous donor to shelter animals. In our petsmart they showcase adoptable animals. I am always impressed by their commitment to help.